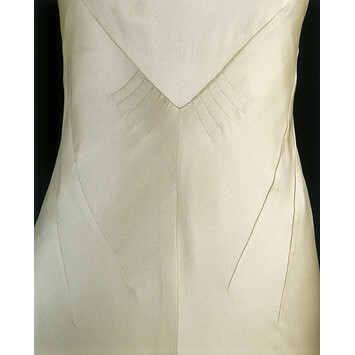 The Parisian fashion designer Madeleine Vionnet (1876 – 1975) is credited with having invented the bias cut. She commented: ‘Maybe because everyone else made dresses that flowed in the same direction, I saw that if I turned the fabric on an angle… it gained elasticity’. 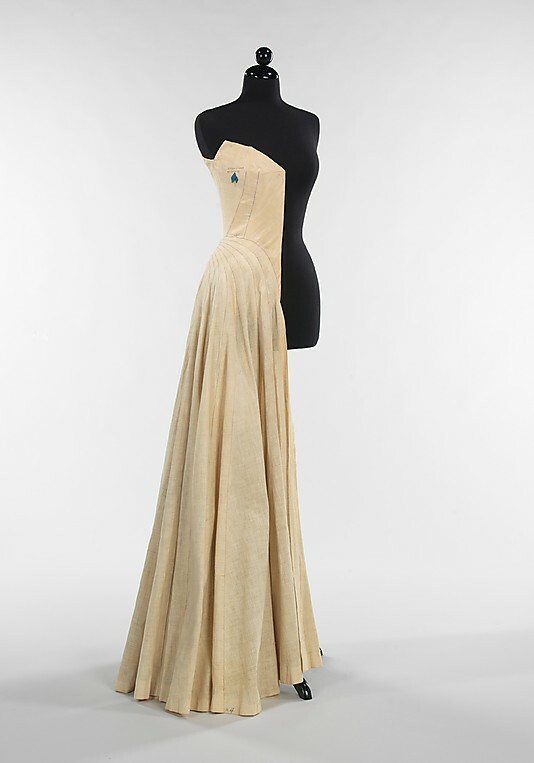 Elasticity is something that this silk satin gown by Charles James (1906 -1978) certainly needs. The wedding gown, which looks as it has been poured onto its mannequin, has no fastenings of any real meaning – not a zip, not a button, not a dome, just a hook and loop at the neck. Created in 1934, it is an early example of the Anglo-American designer’s work. James, who opened premises in London in 1929, was to become renowned for his complex approach to cut and drape. While the gown, which was worn by Barbara ‘Baba’ Beaton on the occasion of her marriage to Alec Hambro, gives the appearance of simplicity, its construction is clever and complex. It is elaborately seamed and darted, especially at the back. James commented ‘all my seams have meaning – they emphasise something about the body’. James has cleverly used the seams and darts to mould the dress to the body while also creating an abstract and pleasing pattern. The darts shown in the detail above, originate from the bust, embrace the waist and artfully shape the hips. James aimed to celebrate the female figure, and in this dress he caresses it with seams. In the muslin toile below, which dates from 1947, he again defines the waist and hip with dynamic seams. The image of the toile and the sketch below, are from the Metropolitan Museum of Art’s online datebase. 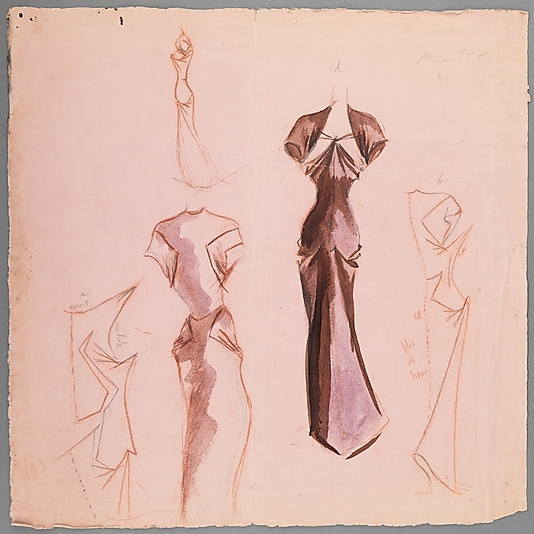 The Met holds an extraordinary collection of finished dresses, sewn muslins or toiles, flat patterns and sketches by James that show his complex design process from beginning to end. For those interested in the intricacies of his designs it is well worth investigating. While Charles James gown for Baba Beaton was very contemporary, her bridesmaid wore a red velvet bustle dress, and the page boys wore Elizabethan ruffs, red velvet jackets and white satin breeches. The wedding was stage-managed by Baba Beaton’s brother, society photographer Cecil Beaton, who ensured that it was a theatrical affair. The wedding dress is one of two satin gowns commissioned by Baba Beaton in 1934. She also commissioned an evening gown.Baba Beaton’s dress by Charles James is one of the stars of Unveiled: 200 Years of Wedding Fashion from the Victoria and Albert Museum, London and is on display at Te Papa until 22 April.